VAASTU SHASTRA is an ancient Hindu practice which tells us how to construct buildings in harmony with natural forces for the well being of an individual as well as humanity as a whole. This precious Hindu philosophy forms the the basis of the traditional Indian system of architecture. Vaastu literally means the dwelling place. 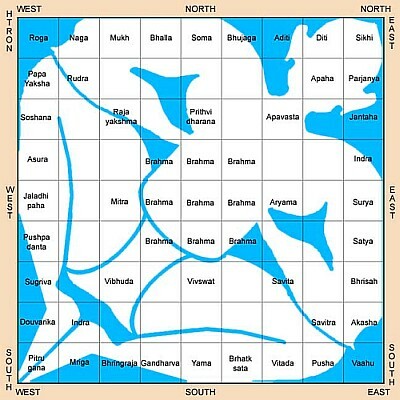 The rules of Vaastu are derived from 'Vaastu Purusha' who is depicted as a man lying with his head pointing northeast, in a grid of usually 64 squares. The different parts and directions are assigned to different Gods and Guardians. The 'Vaastu Purusha' is said to be the spirit of the site. Aesthetically correct dimensions of rooms, doors windows and even the structural parts like plinth and pillars can be determined on the concept of ‘Vaastu Purusha’. Vastu Purusha is described at the end. According to Hindu mythology, Brahma - the creator of the universe, experimented with the creation of a new creature. He created a large cosmic man, who grew rapidly as he began to devour everything in his path to satisfy his insatiable hunger. He became so big that his shadow fell on the Earth creating a permanent eclipse. The gods Shiva and Vishnu begged Brahma to do something before everything was destroyed by this Creature. Brahma realised his mistake and called the Astha Dikapalakas, the Gods of the eight cardinal directions. Together, they overpowered the monster and held it flat against the earth. Then Brahma jumped in the middle and held the monster down. Brahma made the monster immortal with the boon that he would be worshiped by any mortal that builds a structure on earth. He was named Vastu Purusha. So, Vastu Shastra gives the directive principles regarding construction of buildings so as not to displease the Vastu Purusha. 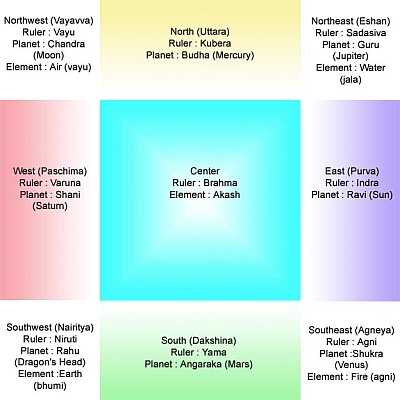 These principles are explained with the help of the diagram called the Vastu Purusha Mandala. The diagram on your left below, known as Vastu Purusha Mandala, is a metaphysical square plan that illustrates how the Vastu Purusha was pinned down by Brahma and 45 Gods - face down, with his head to the North-East and his feet towards the South-West. The diagram is divided into 9x9 = 81 parts. The positions of the 45 gods (32 in the external enclosures and 13 in the internal enclosures) who are holding down the Vastu Purusha are shown. These symbolic gods rule various aspects of life and have certain inherent qualities. The function of the rooms placed in each area of the house is according to the nature of the deity ruling that particular area. See the diagram on your right below. According to Vastu Shastra, the house should be designed as per the Vastu Purusha Mandala so as to create a perfectly balanced environment which ensures health, wealth and happiness for its dwellers. 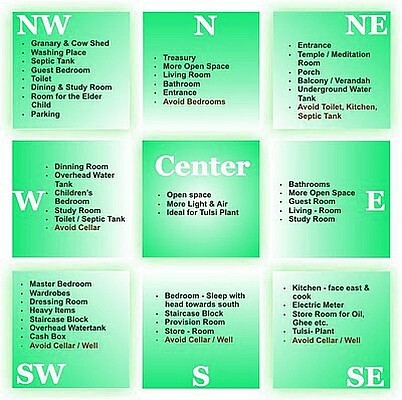 Vastu Dosha are the faults in the planning of the house. For example : Northeast is a sacred area. This is where the head of the Vastu Purusha is located. This area is ruled by the benefic Guru (Jupiter). But if there is a toilet or a bathroom in this area, it will create disharmony and imbalance resulting in difficulties for the dwellers. The purpose of the vaastu of Vaastushastra is to provide guidelines for proper construction of houses, shops, commercial buildings with brand name stores and operating offices etc. Vaastu determines the position of the house with regard to points of a compass and suggests the points to keep in mind with respect to buildings, lines, directions, skylines, elongations, levels, slopes, water (underground and overhead), kitchen, bedrooms, toilets, staircase, heights of ceilings and roofs, entrances, location of doors and windows, compound walls etc. etc. The importance of Vaastushastra lies in the fact that it is a result-oriented science and gives desired results if applied properly. Vaastushastra suggests ways in which we can live in tune with the laws of nature, so that we can be healthy, peaceful and efficiently and prosperous. Directions of a plot can be determined by using a magnetic compass. It is a device for finding direction. It has a freely moving needle which always points to the magnetic North. Make two lines crossing each other dividing a paper in four equal parts at 90-degree angle. Place a compass on paper in the middle of your plot and align it with two lines in the North and the South of the needle of the compass. Extend these lines on the plot and mark it to have exact direction. The size of length, breadth both effect the fortune of the person who lives in it. The Southwest portion of the house is meant for bedroom for adults. It may be located in the South, and will be congenial for comfortable living. Master bedroom may be on the upper storey, if any, in the Southwest portion of the house. Direction of a person while sleeping also has importance in Vaastushastra. One should never sleep having head towards the North Pole and legs towards the South Pole. However one may sleep having legs towards the West and head towards the East for mental peace, good thoughts and spirituality. Children room should be in the northwest or West Side. To have a better concentration they should have a separate study close to their bedrooms. Location of kitchen has health implications. Presiding deity of the Southeast is Agni, the God of fire; hence kitchen may be located the southeast corner of the house. The dining room should be located in the East or the West or the North near the kitchen. Northwest corner is good for perishable goods. Dinning room may be in the Northwest direction, which leads to quicker consumption of food. Drawing room should be preferably in the Northeast or the North or the East but not in the Southwest portion of the house. More vacant space should be given in the Northeast corner of the drawing room. Door is preferable on the East towards the Northeast side. As per Vaastushastra, the East is the place for the bathroom. Attached bathroom may preferably be in the North, or the East of a bedroom. Shower, bathing tub and wash basin in the bathroom may be in the Northeast, or the North or the East direction. One may have bath in the North or the East area in the bathroom. Bathroom should never be constructed in the center or in the southwest corner of the house. Storeroom should be made in the Northwest or Southwest portion of the house. It is very beneficial if grains and other provisions are stored in the Northwest store. All heavy things should be kept in the Southwest of the storeroom. Garbage may be collected in the Southern part of the house.